The presentation shows how hypertextual modelling gives multiple contexts to documents in urban studies, representing an interdisciplinary approach. It starts from the example of a hypermedia program on eighteenth-century cities developed with Director authoring software by the Research Centre "Cultures Anglophones et Technologies de l'Information" (CATI) - Université de Paris-Sorbonne. Such a program focuses on the documents' integration in a contextualized setting (Carter). The pathway structure (McAleese) allows the types of hyperlinks to represent distinct approaches to the subject (Deegan). Integrating electronic documents into humanities studies (Seaman) introduces alternative methods, in accordance with the capacity of hypermedia programs to develop sequentially for literary texts or to follow hypertext links in cultural studies (Madsen). This procedure exploits the aesthetics of cyberspace and its own structures, making full use of the meanings which are encoded in the medium (Murray). The range of documents aims to reconstruct the total experience of the urban world. It complements interactive maps with photographs, pictures and animations, and with literary descriptions or audio files -views of music rooms with extracts of works performed there-; it adds interpretive documents, encouraging reflexive interactivity. The program is designed so that the data should always be seen as part of the structure in which they are embedded (Delany and Landow). 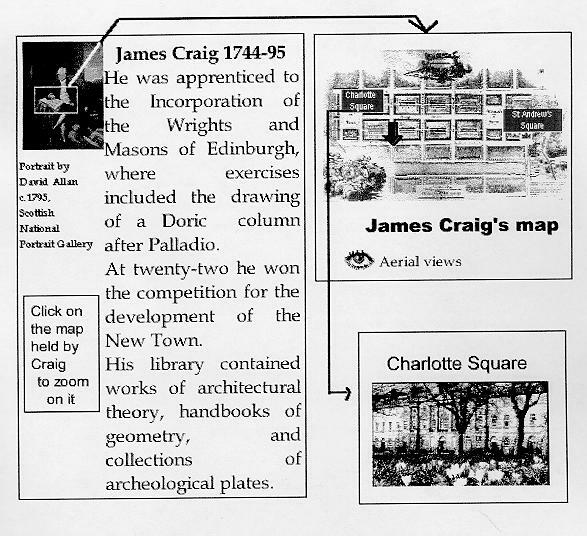 It places each document in a series of choices between views in different scales (an overview of a topic, or a map of a city, leading to subchapters or to buildings indicated by hot spots, with return buttons to the overall view), and in several contexts--for instance a topographical setting and thematic references, as a multidetermined hub of links (Vauxhall linked to a map, but also part of chapters on gardens, music and literature). The semantic structure can change, recentring the thematic nodes: while the navigation bar remains identical, new sets of buttons appear according to the contexts. a)users can at any moment alternate between the information delivery level and that of organization, accessing the site map with its hierarchy of subject headings, where the title of the section containing the current frame is highlighted; for example they may start from a city then move to its section on religion and from there to a general chapter on religion: switching to the site map at that point will highlight 'Topics/Religion' emphasizing that the user has moved from topographical to thematic navigation. b)section and screen: sections are arranged so that a constant element (eg. a map or a view of a building) is retained through several screens while another part of the screen displays additional details in sequence; a button 'return to top screen of section' allows the user to replace a frame in the overall structure. c)screen and document: anchors open on context-sensitive hyperlinks. The conditional links incite the students to make a selection between buttons to move to the next screen, increasing their awareness of the spatial dimensions and temporal structures in literature (Dawson) or in art. Software concepts can be incorporated into issues-based approaches (Bass), so that the variety of interactive effects emphasizes methodological differences in interdisciplinary subjects. Hypermedia integrates the specific software applications developed by several disciplines, imaging their respective methods and goals. Modelling of theories draws attention to methodology (McCarty). Interactivity enriches the interpretation, for instance supplementing architectural morphology with the analysis of society and showing the building in use (Scott), or experiencing the visual axes from many locations of the plan (Thomas). These effects are obtained using the 'perspective' facility in a CAD software, in a simulation of architectural draughtsmanship: having to choose between viewing a building in elevation or in oblique perspective differentiates between these options in architectural drawing (Hiley). The options of hyperlinks on complex documents correspond to distinct interpretive methods, keeping the other options as a background. Some are branching buttons, leading to several types of contextualization, such as that of social and economic life (the museum of eighteenth-century life at 'No 1 The Crescent' or Covent Garden as a market), or literary and artistic representations (Fielding's descriptions and Hogarth's paintings). Others start problem-solving sections in activity spaces, for instance integrating the history of mathematical methods into social history: in a simulation of cartographic methods, interactive objects representing surveyors and their instruments can be activated by the user to reconstruct the phases of map-making; the two options underline the differences between surveying, where the user has to move a figure of a surveyor associated with conditional scripts, and using trigonometry, where the user has to enter calculations in an editable field. Mediating documents through electronic presentation emphasizes the interaction of content and method. Bass, Randall. "Integrating Research and Pedagogy through an Electronic Archive Project in an American Studies Curriculum," ACH / ALLC Conference 1994. Carter, Bryan. "From Imagination to Reality: Using Immersion Technology in a Literary Setting," DRH 98. Dawson, John L. "A Dimensional Analysis of Narrative and Dialogue," ACH / ALLC Conference 1994. Deegan, Marilyn. "Transgressing the Boundaries of Texts," Gestion électronique de données et nouvelles technologies en sciences humaines (Paris: Presses de l'Université de Paris-Sorbonne, 1995) 33-42. Delany, Paul, and George P. Landow, eds. Hypermedia and Literary Studies (Cambridge, Mass. : MIT, 1991). McAleese, Ray, and Catherine Green, Hypertext: State of the Art (Oxford: Intellect, 1990). Madsen, Deborah L. "Hypertext and Critical/Cultural Theory," Computers and Texts 11 (March 1996) 4-6. Murray, Janet H. "Hamlet on the Holodeck or Towards an Aesthetics of Cyberspace," ACH / ALLC Conference 1994. Scott, Sarah, Simon Fitzpatrick, Ellen Pawley, and Helen Pownall, "Architecture and Society : Interactive Approaches to Architectural Design and Use," Craft, 18 (Summer 1998): 7-9. Seaman, David M. "From Margin to Mainstream," ACH / ALLC Conference 1994.